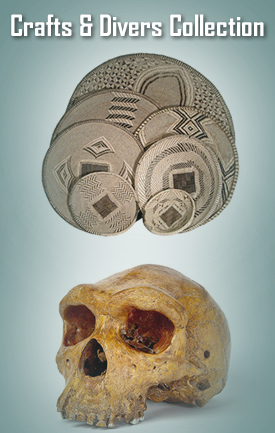 The Archaeology/History Gallery is divided into two parts; the first part is a section dealing with Pre-historic period giving details on the Cultural Development of humans in Zambia, the Stone Age period to Iron Age. The section depicts prehistoric activities at Kalambo Archaeological Site and Rock Paintings at Mwela Rock Site. Evidence of human activities such as stone tools were unearthed at Kalambo Falls by Professor Desmond Clark who has written a number of books on his exhibitions all of which are housed at the moto moto museum. The second part of the gallery gives a background to the history of our country and narrates the migratory origin of peoples of Zambia; their involvement in slave trade, colonialism and struggle for our independence.